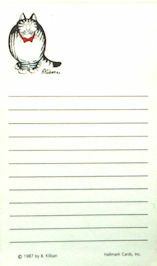 This little Kliban notepad is copyrighted 1987 by Hallmark Cards. Kliban cat is sporting a red bow tie. The notepad is 3" wide x 5" high. There appears to be approximately 100 sheets on this notepad. Previously owned but in good condition.